Mini Garden Loom Class, Zest Wishes Brunch, Chef AJ, Author of Unprocessed, at Schwartz Living Market in Pittsburgh's Historic South Side! Free Live music on Friday afternoon, June 13, 2014, from 1:00 to 2:00 PM with The Monsters first ever concert! Andrea, the Yarn Super Hero, will be offering a Mini Garden Loom Class! Attract birds to your yard, porch, or garden with a beautiful, ever-changing work of fiber art! The fee is $25.00/person, with all materials provided. To reserve your spot, call 412-303-4409. Schwartz Living Market, a Living Building Challenge project, and an Urban Oasis for Healthful Living with a Juice Bar and Vegan food offerings on site, educational classes, and more, is offering Vendor Space, and educational event space for lease. Contact us through the Schwartz Living Market Facebook page, at schwartzlivingmarket@gmail.com, or 412-491-0303, for details. The Enchanted Garden's newest filtered, fresh water creation with fresh cucumbers, lemon and mint ! The Enchanted Garden Juice and Smoothie Bar and Jonathan's Foods, are our anchor vendors Tuesdays through Saturdays 11:00 AM to 5:00 PM. 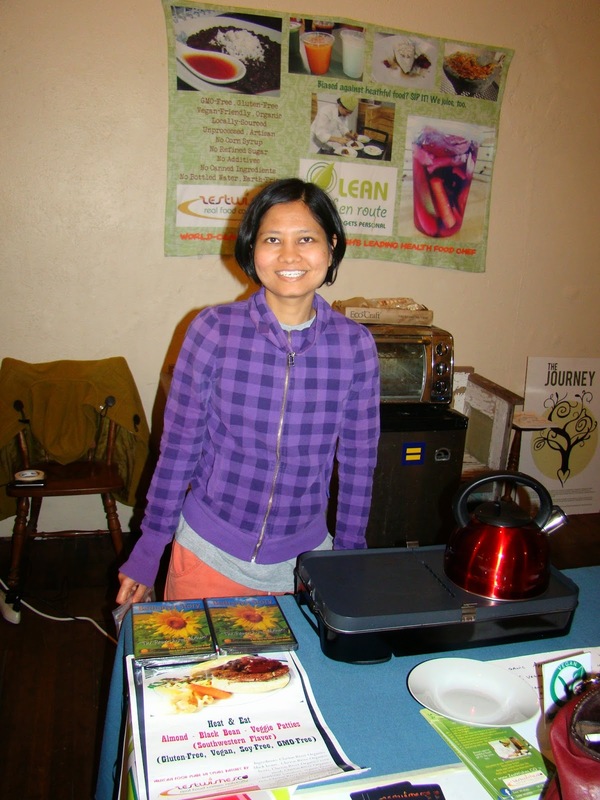 On Saturdays Zest Wishes, Mya Zeronis, the Lean Chef en Route, Soup For Your Soul, with organic soups, Third Day, soaps, lotions and body scrubs, and more! Vendor spaces are available for rent: E-mail schwartzlivingmarket@gmail.com or call 412-491-0303 for details. May, 2014 at Schwartz Living Market: Earcupuncture, 'Burghman, Zest Wishes, and more! Schwartz Living Market, SLM: An Urban Oasis for Healthful Living is located at 1317 East Carson Street, in Pittsburgh's Historic South Side. Free parking behind the market across Bingham Street for customers! Our anchor vendors are Jonathan's Vegan Gluten Free Foods and The Enchanted Garden Juice Bar at the market Tuesdays through Saturdays 11:00 AM to 5:00 PM. Other vendors include 'Burghman, aka Mark, and the educational Vision Gym with Dr. Elisa Haransky-Beck, developmental optometrist, on Thursdays. On Saturdays, Pamela Arder of Soup for Your Soul, Mya Zeronis of Zest Wishes, Cynthia Hill of Third Day with handmade soaps, lotions and body scrubs, and David Smith of Yellow Corn Native American Recovery. Saturday you can also sometimes talk with photographers Richard Snyder and Laura Beck, whose works are for sale. What is a Living Market? A Living Market is one that breathes and presents new surprises, regularly! What is new at Schwartz Living Market? 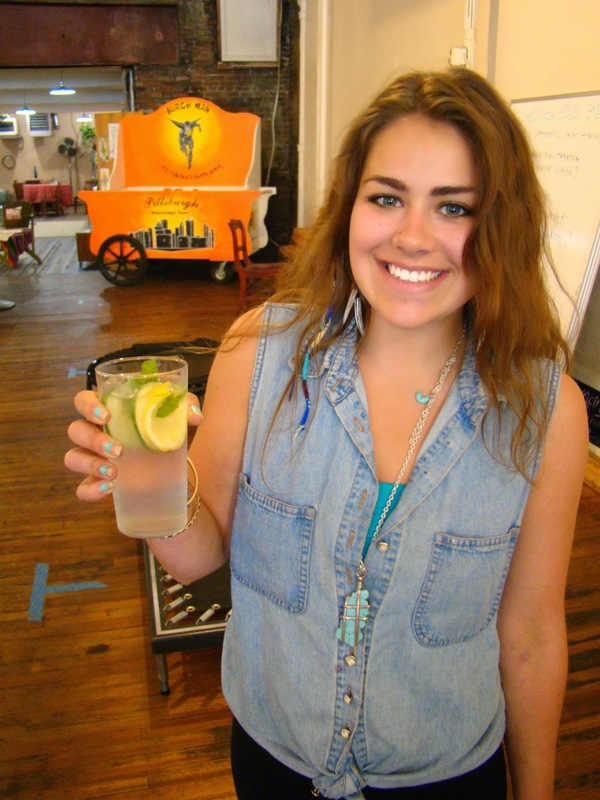 We are so excited to announce our newest Saturday vendor: Mya Zeronis of Zest Wishes, aka, The Lean Chef en Route! Zest Wishes is now at the market on Saturdays! Mya Zeronis, The Lean Chef en Route of Zest Wishes! Package from Zest Wishes amazing black bean burgers available for purchase on Saturdays at SLM! 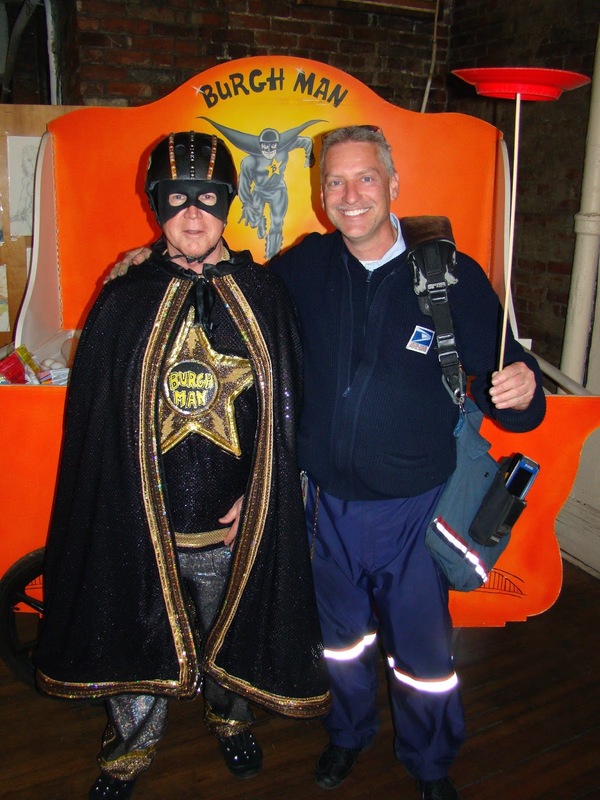 Our newest Thursday vendor is Mark, aka, 'Burghman! Have you ever wondered how to juggle or spin a plate on top of a dowel rod? 'Burghman teaches children and adults how to juggle and spin plates on Thursday afternoons at the market, free of charge! Sarah Heiber, Acupuncturist, will be offering walk-in Earcupuncture on Saturday, May 17, 2014, from 11:00 AM to 2:00 PM! Walk-ins welcome! See you at the market! Be sure to tell all your friends about us and LIKE Schwartz Living Market on Facebook! 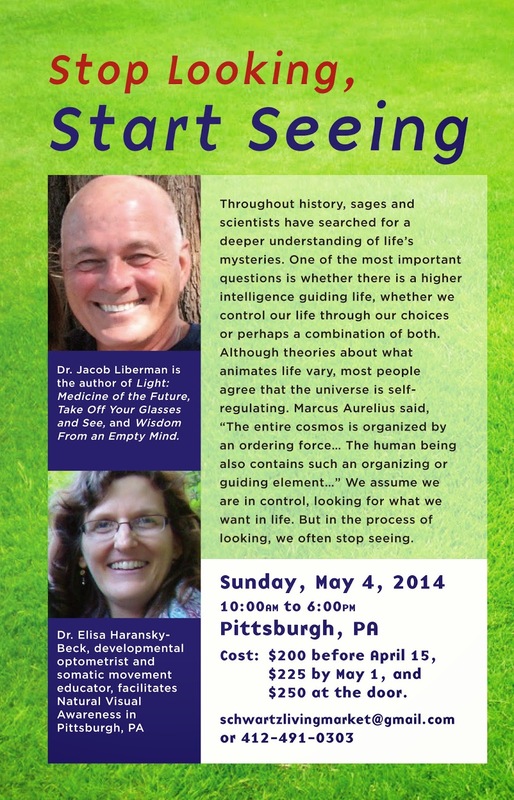 Stop Looking Start Seeing with Dr. Jacob Liberman and Dr. Elisa Haransky-Beck, Sunday, May 4, 2014 at Schwartz Living Market in Pittsburgh's Historic South Side! Sunday, May 4, 2014 Dr. Jacob Liberman of Maui, Hawaii and Dr. Elisa Haransky-Beck of Pittsburgh, PA at Schwartz Living Market facilitate Stop Looking, Start Seeing! Go to Brown Paper Tickets and enter the event name Stop Looking, Start Seeing to register, or contact us through schwartzlivingmarket@gmail.com, or at 412-491-0303! Suppose for a moment that you don’t see with your physical eyes — that you have no single “point of view,” but can see clearly from all places at once. While meditating twenty-five years ago, I actually slipped into this indescribable state — and experienced a miraculous change in my vision. Although my eyes were closed, I could “see” myself sitting there in meditation — only I couldn’t tell where I was seeing myself from. It was as if the room was filled with eyes, and I was looking through all of them. When I finally opened my eyes, my vision had undergone a profound change — from barely being able to see the eye chart, to seeing better than normal — and it has remained so to this day. Since I was a practicing optometrist at the time this shift occurred, it forced me to reconsider everything I had ever been taught about vision. I realized that it is our insight, and not our eyesight, that must be healed if we wish to see clearly — and that only by seeing beyond our beliefs can we truly see clearly. Here's the scoop on how to travel to Schwartz Living Market this coming Sunday, May 4, 2014, for the amazing, not to be missed workshop, Stop Looking, Start Seeing from 10 AM to 6 PM, with visionary Dr. Jacob Liberman, of Maui, Hawaii, and Dr. Elisa Haransky-Beck, of Pittsburgh, PA! Go to the website www.pittsburghmarathon.com/raceweekend On that page, Scroll down, and go to the large heading: Getting Around Town, then to one or all of the four links about road closures...If you still cannot figure out how to get to the location, you can call this phone number: 412-586-7785. Explain you are going to a workshop event that begins Sunday at 10:00 AM in the South Side between 13th and 14th Street on East Carson and you need to know about road closures. Schwartz Living Market hours are 11:00 AM to 5:00 PM Tuesdays through Saturdays. Our anchor vendors Tuesdays through Fridays are Jonathan's Foods and The Enchanted Garden Juice and Smoothie Bar. Our newest Thursday vendor is the one and only 'Burghman! Dr. Elisa Haransky-Beck's Educational Vision Gym is open on Thursday afternoons and many Saturdays between 2:00 and 4:00 PM. On Saturdays, in addition to our five day a week vendors, Pamela Arder of Soup For Your Soul, Cynthia Hill of Third Day, Gloria Pierson of Designs By Gloria, David Smith of Yellow Corn, photographs by Richard Snyder and Laura Beck, and our newest vendor, the Lean Chef, en route, Mya Zeronis! Vendor spaces are available for $25.00/day. The space is also available for rental for special events during market hours and after market hours. Please inquire through schwartzlivingmarket@gmail.com, through the Schwartz Living Market Facebook page or at 412-491-0303. Please share this information widely, and be sure to LIKE Schwartz Living Market on Facebook! Go to http://1317eastcarson.blogspot.com for upcoming events at your favorite South Side destination, Schwartz Living Market! Saturday, May 10, 2014, at 1:00 PM: Vegan Mother's Day Brunch prepared by Mya Zeronis at the market . Check for details on the Zest Wishes Facebook page and in a few days on the Schwartz Living Market Facebook page. Tuesday, June 17, 2014, in the evening, and during the day on June 18, and June 19, 2014: Schwartz Living Market will host Activation Invitation. Details to follow! This will be a fun, voluntary experiential activity facilitating the movement of the development of Schwartz Living Market and the process at 1317 East Carson Street.